Scientists have reported evidence of lakes dotted around Titan’s northern hemisphere. Radar imagery obtained by the Cassini spacecraft on 22 July 2006 revealed dark patches less than 100 km long. False-colour images published 4 January 2007 in the journal Nature highlight lakes filled with liquid methane. It would appear that Earth is no longer the only planet in the solar system with liquid on its surface. 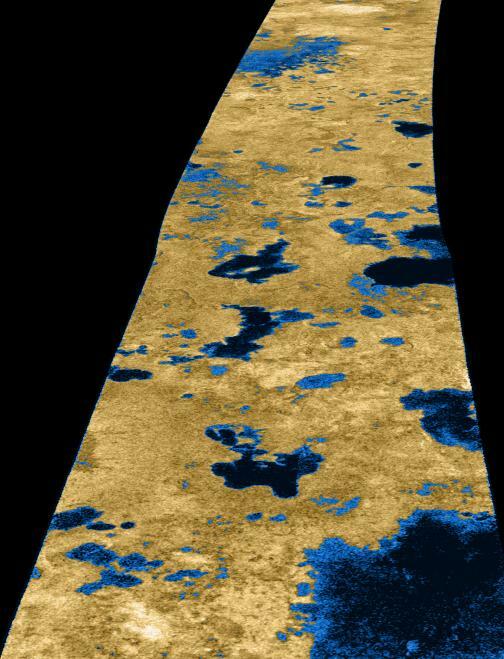 Radar imagery obtained by the Cassini spacecraft on its flyby of Titan on 22 July 2006 provides evidence that the Saturnian moon’s north pole is surrounded by numerous lakes. More than 75 lakes between 3 and 70 km long have been identified, confirming models of Titan’s chemistry that had predicted the presence of surface lakes or oceans. 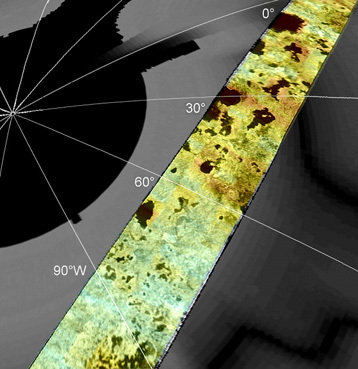 False-colour SAR image radar-dark pathes around Titan's north pole. Copyright : NASA/JPL/USGS. 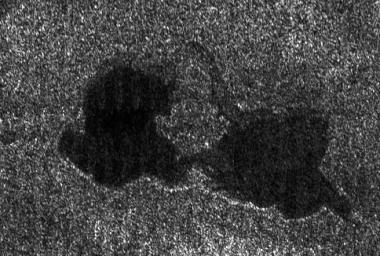 This Cassini radar image shows two lakes "kissing" each other on the surface of Saturn's moon Titan. Copyright : NASA/JPL. The lakes show up in the radar images as dark patches with morphological features very similar to lakes on Earth. They have associated channels running in or out of them and are located in topographic depressions. Their surface appears smooth, indicating that they are likely to be liquid, probably methane or a mixture of methane and ethane. Below 70 degrees latitude, some areas are not as dark and resemble dry lake beds, which proves that they come and go with the seasons or local weather conditions. A view of Titan’s north pole surrounded by lakes. Crédits : NASA/JPL, Cassini Radar Team, F. Paganelli. Imagery acquired 2 years ago by the European Huygens lander revealed terrain features looking like channels and accumulated material. Other radar data obtained by Cassini, showing ice volcanoes or “cryo-volcanoes”, suggest that Titan has a methane cycle similar to the water cycle on Earth. The presence of lakes supports this hypothesis. Hydrocarbons could be upwelling from underground and cryo-volcanism would explain emissions of methane in Titan’s atmosphere and from certain surface features. Cassini’s radar is likely to make yet more tantalizing discoveries of geological activity on Titan as it continues its mission over the next 2 years, despite the moon’s dense and murky atmosphere.